[RoboAvatar]’s Chess Robot consists of a gantry-mounted arm that picks up chess pieces and places them in their new location, as directed by the software. The game begins when the human, playing white, makes a move. When a play has been made, the human player presses a button to let the robot to take its turn. You can see it in action in the videos we’ve posted below the break. Running the robot is an Arduino UNO with a MUX shield as well as a pair of MCP23017 I/O expander chips — a total of 93 pins available! Thanks to all those pins, the Arduino is able to listen to 64 reed switches, one for every square. The robot detects the human’s move by listening to its reed switches and identifying when there is a change. The gantry consists of X and Y tracks made out of PVC slabs, with half-inch lead screws turned by NEMA-23s and powered by ST-6600 stepper drivers. 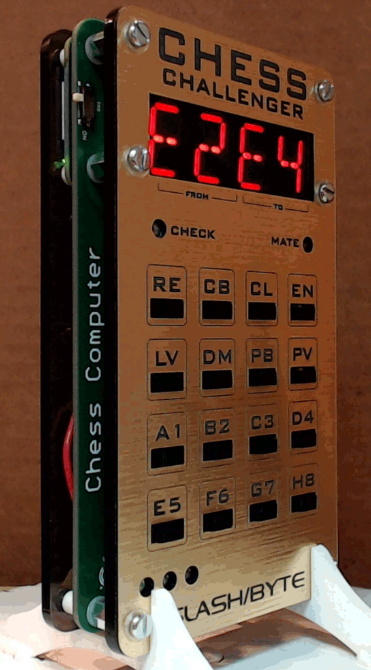 Unlike some chess robots that rely on pre-existing software, this one features a custom minimax chess algorithm that [RoboAvatar] coded himself. It consists of Python scripts run on a computer, which interacts with the Arduino via a serial connection. In the second video, he explains how his algorithm works. You can also download the Arduino and Python files from [RoboAvatar]’s GitHub repository. You’d be surprised how many chess-playing robots we’ve published, like the ChessM8 robot and this voice-controlled chess robot. Chess has been around for an awfully long time, automobiles less so. However, there’s no reason the two can’t be combined, like in this chess set fashioned from automotive components. The project was made as a gift, and is the sort of thing that’s quite accessible for an interested maker to attempt at home. Parts used to build the set include valves, valve springs, spark plugs, castellated nuts and pipe fittings. As the parts don’t actually need to be in good working condition, a haul like this could likely easily be had for less than $50 from the local pull-it-yourself wrecking yard — or free if you know a mechanic with some expired engines lying around. The metalworking side of things involves trimming down and welding together the parts, before polishing them up and applying a coat of paint to create the white and black, or in this case, gold and black pieces. Overall, it’s a fun weekend project that could be tackled in any number of ways depending on your creativity and taste. For a different take, check out this 3D laser cut chess set.